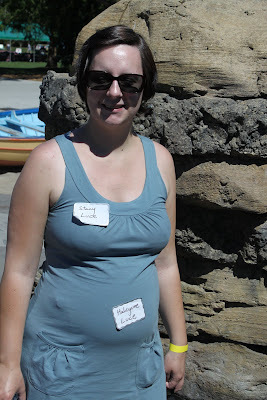 Yesterday was Tom's company picnic at Woodland Park Zoo. We figured out that if we could get a handicapped parking space near the West entrance it would be a short enough distance to the picnic area that I could probably go as long as we had my lounging lawn chair. The zoo was crazy busy. It took several drives through the parking to find a free handicapped space. (They only had 2 for each entrance!?) We parked and walked in, Tom set up my lawn chair, and I got to enjoy the fresh air and a little sun. We got to enjoy yummy alder smoked salmon, strawberry shortcake, fresh fruit, and salads. Tom made name tags for both Haly and I. 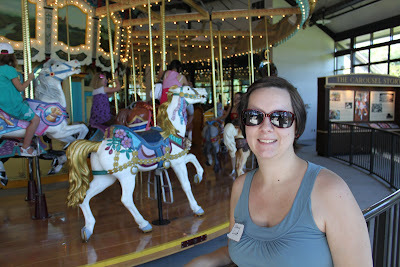 There was an old carousel right next to the picnic area that we got to ride. Tom and I sat on one of the "chariots" rather than the horses. Either the music or the spinning made Haly wake up and start bouncing. Because I'm not supposed to walk we didn't get to enjoy all the animals on this trip. 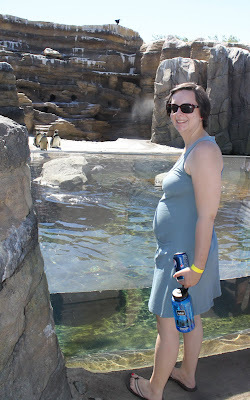 However, the new penguin exhibit is right next to the exit, so we walked past them on our way out. Watching them swim in the cool water really made me wish I could go swimming!